The mother of a boy who has up to 100 epileptic fits a day has been told by a government minister that potentially life-saving cannabis oil confiscated from her at Heathrow will not be returned. Charlotte Caldwell was not cautioned when she was stopped by customs officers trying to “openly smuggle” the substance into the UK from Toronto. She then went to the Home Office to meet the minister of state, Nick Hurd. She has vowed to obtain more cannabis oil to help her 12-year-old son, Billy, for whom she said it has proved to be an effective treatment. Last year, Billy became the first child to be prescribed medicinal cannabis oil on the NHS. He then reportedly went 250 days without a seizure. However, his GP was later ordered by the Home Office not to renew the prescription or face disbarment. Speaking at the time, Dr Brendan O’Hare said there was an “ethical issue” with preventing Billy from accessing medicinal cannabis because “the reduction in his fit frequency is huge”. Caldwell said she feared the fits “would eventually kill” Billy. His next dose was due at 3.30pm on Monday, she said, and warned of the dangers of missing his first treatment in 19 months. Caldwell, from Castlederg in Northern Ireland, told reporters the customs officers were “absolute gentlemen … really, really nice”. One had tears in his eyes as they took the drug from her, she said. “I’ll just go back to Canada and I’ll get more and I’ll bring it back again,” she said. She described the substance as “a small bottle of oil that’s keeping my son alive” and said “my son has a right to have his anti-epileptic medication in his country, in his own home”. 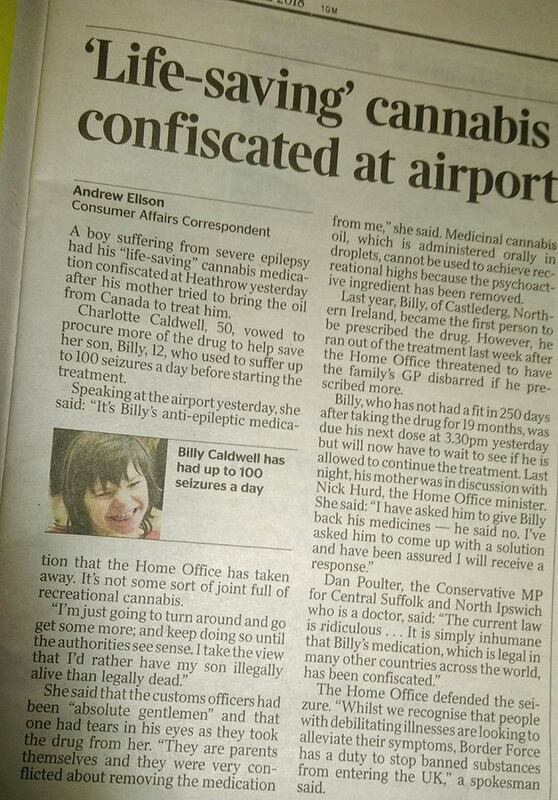 At a press conference, Caldwell said: “It’s Billy’s anti-epileptic medication that Nick Hurd has taken away. It’s not some sort of joint full of recreational cannabis. Caroline Lucas, a vice-chairwoman of the all-party parliamentary group for drug policy reform, said: “Rather than cracking down on parents who are trying to help alleviate the suffering of their children, we should be legislating according to the evidence and giving people the treatments they need.MPs and experts condemned the move and said it highlighted the deep injustices people face due to Britain’s outdated drug policy. David Nutt, a former government chief drugs adviser, who has advocated for the legalisation of medicinal cannabis, said Caldwell had proved cannabis oil effectively cured her child and could save his life. A Home Office spokesperson said: “The Home Office is sympathetic to the difficult and rare situation that Billy and his family are faced with. It emerged last year that the UK is the world’s largest producer and exporter of cannabis for medical and scientific use. It provides the majority of the world’s medicinal cannabis exports, 67.6%, mainly to countries with more liberal usage laws. The World Health Organization’s expert committee on drug dependence has committed to reviewing the scheduling of cannabis under the UN 1961 single convention on narcotic drugs.